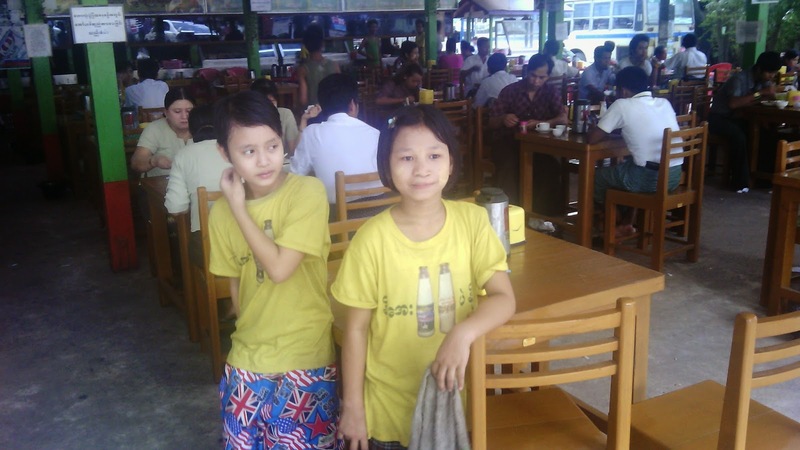 The wait staff at the burmese restaurant (or teashop in the local parlance) where I have lunch are young boys and girls. I see them there when I am on my way to work in the morning and a see them when I leave at night. It is full time job and they are good at it. They work with an efficient nonchalance that only comes with time. They have been waiting tables for a while and they do it with gusto. 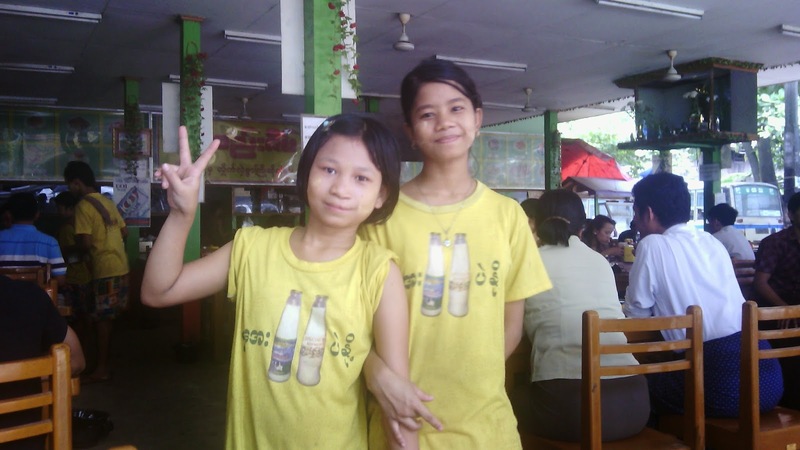 They are also children, between 13 and 17 years old. Sometimes, they break out in play between the tables and often they sing a song while bringing you tea. They are overseen by a 20-year old, who sometimes barks at them in a loud voice when the service is not prompt enough. Or at least I think he barks at them. All orders are yelled back to the kitchen and as the restaurant is open to the street, it takes a bit to be heard. They were obviously pleased when I asked to take their picture. As all children, they goofed around in front of the camera. They have bright smiles, and quick hands and are quick to calculate the luncheon tally. It is also child labour. Maybe not of the kind of kids tied to their loom, but child labour nonetheless. These kids do not go to school and do not play games with their buddies. They spend a good part of their childhood working and because they work, their families have a bit more income. All wait staff in teashops are young, I don't know what happens to them when they grow up. So what do you do with that? There is little ambiguity: the signs and what they signify are pretty clear. 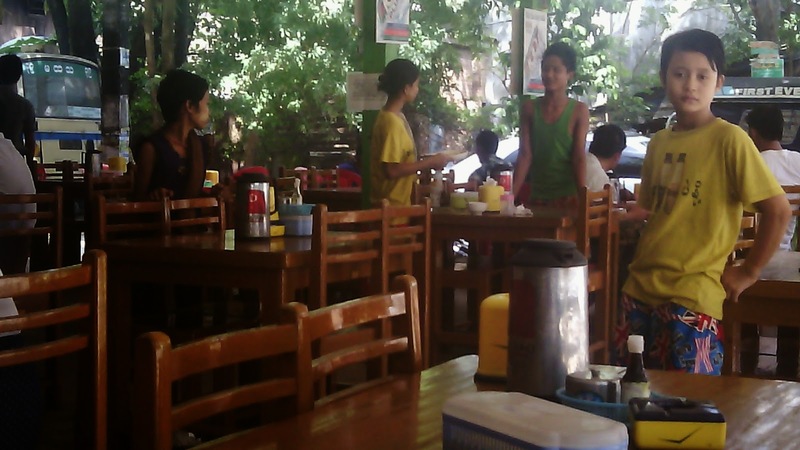 My fellow diners and I are complicit, as are all the diners in all the teashops in Yangon and beyond. And every street corner has a teashop. Pretty clear as well is that the firm application of child labour laws would lead to misery for the kids and their family. There are simply no educational alternatives for my wait staff and no limited income opportunities for their families in the short term. There is at least a discussion about the small percentage of state spending that goes to education. Development is complicated and childhood in poverty is short. 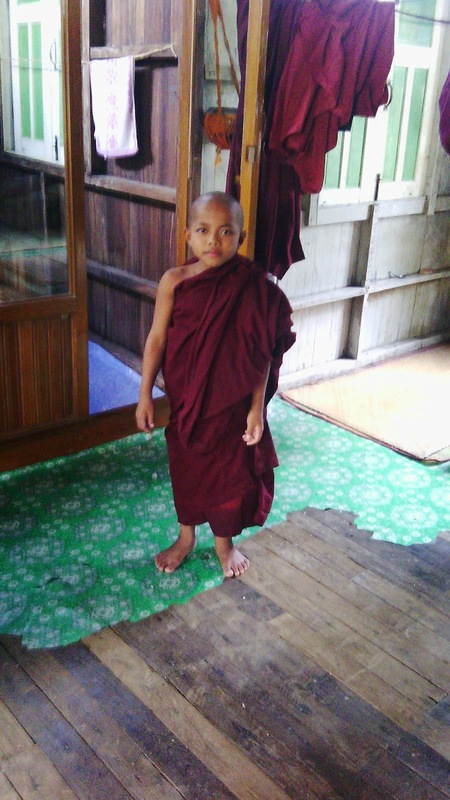 Harder to signify is the large presence of young boys and girls among the Buddhist monks and nuns. Some cannot be older than eight or 10 years. Kinderarbeid is verkeerd maar begrijpelijk in arme landen. Het kan slechts bestreden worden met schoolplicht en een sterke overheid. Dus moet daaraan geklust worden en is symptoom bestrijding niet zo effectief, al zou je dit stelletje mooie kinderen morgen op devschoolbankennwillen zetten! Cuso of wie dan ook kan alleen maar beginnen bij het fundament. Ben steeds nieuwsgieriger naar jullie en jou voortgang bij jullie taken en doelstellingen.